The European Union Value Added Tax (EU VAT) is type of a tax which is levied on most goods and services that are traded for consumption within the EU. It is applied when a VAT registered business sells goods or services to buyers based in EU. "Value added" in VAT refers to the amount by which the value of a product is increased at each stage of production and distribution. You can either register for VAT in each EU member state where you sell your products. Or you can register for VAT MOSS (consider this option if you sell digital services online to more than multiple EU member state). If your buyer is from the EU member state where your business is domiciled then the VAT rate of your member state is applied, irrespective of the buyer being a consumer or a business. However, irrespective of the type of service provided, if your buyer has a valid VAT number and is from a different member state, VAT is not applied. This is in keeping with the reverse charge mechanism which puts the tax liability on the business buying from you. The rates are subject to change based on EU VAT Notice/ announcements. Rates last updated on 12th Oct 2016. Chargebee collects the Billing Address country and IP Address of the buyer and will store this information for a minimum of 10 years in compliance with regulation. Buyer's name or trading name, and address. The invoice contains the applicable VAT rate for each line item and a subtotal amount before applying VAT and a final invoice amount after VAT is added. You can configure EU VAT invoices on the Invoice Customization page. Navigate to Settings > Configure Chargebee > Invoices, credit notes and quotes. Make sure you've added your organization address at Settings > Configure Chargebee > Business Profile. You cannot configure taxes in Chargebee without an organization address. Go to Settings > Configure Chargebee > Taxes and click the Enable Tax option. Once taxes are enabled, you will be redirected to a page containing all the currencies that you have enabled for your site. This step is about configuring a price type for each currency. This decides whether the price that you quote for your product/service/addon can be either inclusive of tax, where tax is included in the price, or exclusive of tax, where tax is added to the price. VAT invoicing rules call for your invoices to reflect the VAT rate that you are applying. This means that you will have to set your Price Type to Tax Exclusive if you are selling to customers residing in the EU. Choosing the EU VAT option in the dropdown menu will redirect you to a page dedicated to countries in the EU. Select and add the countries where you are liable to pay taxes. Set the tax label as EU VAT and enter your VAT Number here. This will be displayed in the invoices sent to your customers. Choose this option if you want Chargebee to validate your Customer's location information. Learn more. Enable this option if you expect your customers to enter their VAT Number while creating a subscription. Choose whether to perform EU VAT Validation against VIES or not when the VAT number is entered by your customers. If you sell to businesses, it is recommended that you collect the VAT Number of your Business customers and ensure that it is valid. Chargebee verifies the validity of a VAT number entered against VIES. Enable this option if you sell to Italy and Spain. Refer FAQ for more details. When this is enabled, an advanced VAT validation is performed. Learn more about it in this section. Enter the VAT Exemption note to be displayed in the invoices when sale is made to other Businesses (reverse charge scenario). The VAT Exemption Note will be displayed at the bottom of the invoice. Up next, choose between the I sell digital products and the I sell Non-Digital products options in the EU VAT configuration page. This will help Chargebee apply an appropriate tax rate to your invoices, as EU VAT regulations specify different tax rates for digital and physical products. If you are selling digital products to a large number of countries in the EU, registering for VAT in individual member states could be a difficult task, with 28 countries and a total of 27 different VAT rates. Instead you can register for the EU's optional program to simplify the VAT process called the Mini One Stop Shop (MOSS), which enables businesses to register in one country and pay their dues with a single payment. The country mentioned in the billing address will be considered for tax calculation. Learn more about VAT MOSS. If you are selling physical products to a number of countries within the EU, the VAT rate of your country is applied. Simply enter the country where you are domiciled and your VAT Number here and Chargebee will calculate what rates are applicable to your invoices. For tax calculation, Chargebee will consider the country mentioned in the shipping address. However, in case of absence of shipping address, the country in the billing address will be taken into account. If you cross a certain threshold of sales per annum (the threshold figure differs from country to country) you will have to register for VAT in the member states where you have a commercial presence. 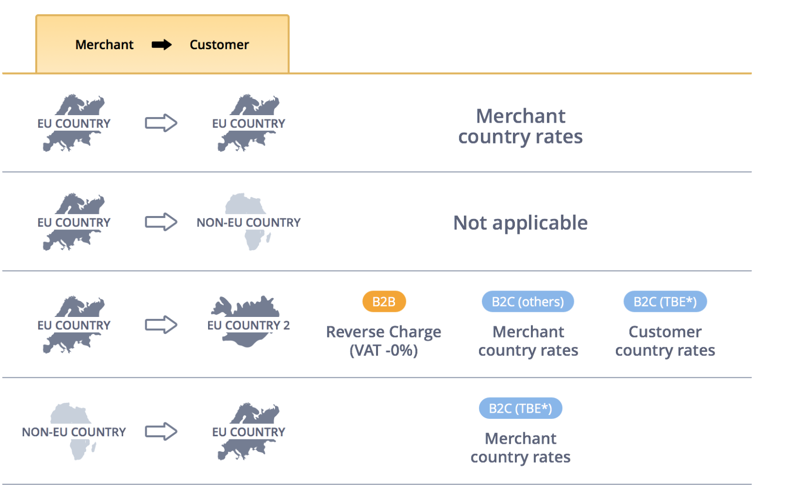 Chargebee will apply destination based tax in case you have crossed the threshold of the sales to a EU Member State, i.e., if you have registered in that country. Chargebee captures the following address/location information as evidence of a customer's place of residence in adherence with the EU VAT location requirements. If you disable this feature, you have to collect the following evidences by yourself, to ensure that your customer is from the EU. Hosted Pages: If you have integrated with Chargebee using the hosted pages, the IP Address of the customer will be collected automatically. API: If you use the Chargebee API, you will have to pass the IP Address of the customer to Chargebee using the User Details Header API. The first six digits of a card constitute the Bank Identification Number (BIN). BIN gives us the information about the card issuing bank and hence can be used as a way to determine the customer's location. Hosted Pages: If you have integrated with Chargebee using the hosted pages, the BIN of the customer will be collected automatically. API: If you use the Chargebee API, you will have to pass the BIN of the customer using the card [number] parameter in the Create a customer API. If the Location Validation option is enabled and the validation fails, the customer will not be able to complete the order. The policy updates are applicable from August 22nd, 2017 onwards. Chargebee validates VAT Number by sending a validation request to VAT Information Exchange System (VIES), a search engine owned by the European Commision. You as a merchant may have a tax registration number in different EU member countries. Alternatively, for providing digital services more conveniently across the EU region, you may have registered for VAT MOSS. The VAT number(s) you enter will be validated automatically when provided. You can click on Mark as valid to ignore and override the VIES validation result. No response from VIES, or other errors. Chargebee retries validation attempts periodically for such VAT numbers. Your customers can enter their VAT Number when you enable the Collect Tax Registration Number option. You can mandate VAT Number validation by enabling the Enable VAT Number Validation option. VIES can help you prove to the Tax Administration Department that you have successfully validated your customer's VAT number at a certain time. This involves using a special VIES validation enquiry that on successful validation, generates a unique VAT Consultation Number. When you enable this feature in Chargebee, this number is requested for and stored for your convenience. (You can view/export this information under Settings > Import & Export Data > Export Data > VIES VAT Validation History.) This advanced VAT validation service in fact, checks your own VAT number along with your customer's, and both must be valid for the consultation number to be generated. If this validation fails on any attempt, then as a fallback, Chargebee performs the basic VIES validation of your customer VAT number. During VAT validation, if Chargebee finds your previously valid VAT number to be invalid, the site admins and the site owner are immediately notified via email. The Consultation Number and VAT Validation attempt related details will be available starting 30th Nov, 2018. If you are using multiple tax profiles, only the VAT numbers in your primary profile will be used for generating the Consultation Number. Allow to store the VAT number and proceed with creating subscription - this is the default setting in Chargebee. Restrict subscriptions from being created in case VAT number status is not known - contact support@chargebee.com to configure this option. Based on your choice, Chargebee creates subscriptions (or not). VALID - If the VAT Number is VALID, then VAT will not be applied and subscription will continue to renew. INVALID - If the VAT Number is found to be INVALID, upcoming invoices will have VAT applied. Also, Chargebee will send emails with details of such customers to the site admins and the site owner. During subscription renewals, Chargebee will validate your customer's VAT Number, if it was not validated in the last 3 months. If a VAT number is found to be INVALID, VAT will be applied on the upcoming invoices. 1. How to enable VAT Number to be displayed in the Hosted Pages? For a transaction to be considered B2B, a valid VAT number has to be provided by the customer. If you use Chargebee's hosted pages, enabling the VAT number option will display the VAT Number field in the checkout pages. Hosted Pages v2: Navigate to Settings > Configure Chargebee > Checkout & Portal > Field Configurations and enable the VAT Number field under the Tax Information section. Checkout Pages v3: Navigate to Settings > Configure Chargebee > Checkout & Portal > Fields > Billing and enable the VAT Number field. 2. How does Chargebee apply taxes when Shipping & Billing addresses are present? For tax calculation, Chargebee will consider the country mentioned in the shipping address linked to the Subscription. in absence of a shipping address, the country in the billing address will be taken into account for tax calculation. If both are not available, tax will not be calculated/ applied. 3. Can I change the Tax Exclusive/Inclusive settings? Yes, you can change the Price type, i.e., whether the prices shown during Checkout should be Tax Exclusive or Inclusive. 4. What is the difference between VAT MOSS and non-MOSS registered merchants? VAT MOSS Registered Merchants: If you have registered for VAT MOSS you will need to enter the VAT MOSS registration number. Chargebee will apply destination based tax for VAT MOSS registered businesses, i.e., the VAT rate of the EU Member State where the sale is made to, irrespective of the country you are registered in. Non-VAT MOSS Registered Merchants: If you have not registered for VAT MOSS you will be given options to select the countries in which you have a presence and manually enter the VAT registration number for each country where you sell. 5. When is the Reverse Charge Mechanism applied? The buyer is registered in a different EU country. 6. How does Chargebee differentiate between a B2B and B2C transaction? VAT numbers are used to distinguish between your individual customers and your business customers. If you are selling to a buyer without a VAT number, the transaction is considered a B2C transaction and the buyer is considered an individual/consumer. If you are selling to a buyer with a valid VAT number, on the other hand, the transaction is considered B2B and the buyer is treated a business. 7. How to view customers whose VAT Number is invalid? Chargebee will mark the customer's VAT Number status as valid/invalid based on the response from VIES. You will be able to filter the customers with an invalid VAT number and get in touch with them, asking them to update a valid VAT number. If the customer has confirmed that the provided VAT number is valid and VIES shows that it is invalid, as per the following European Commission FAQ the customer will be required to contact their fiscal administration. 8. What is the significance of enabling location validation for Country of Business? For certain countries such as Italy and Spain, the VAT numbers of businesses that trade within the country are not automatically available in the VIES database. Such businesses need to explicitly register their numbers in VIES if they trade with EU countries outside of their country of business. In such cases, Chargebee will not allow subscriptions to pass through since the VAT number status will be unverified and, therefore, invalid. Use this option to disable VAT Number validation for your country of business, and Chargebee will allow subscriptions to pass through. 9. 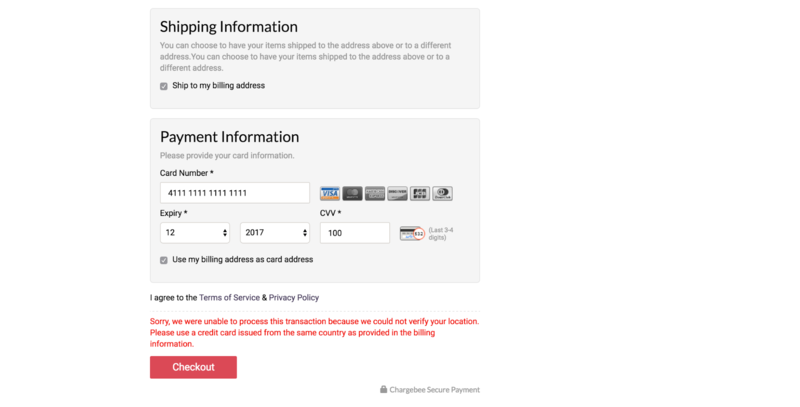 How does Chargebee handle location validation when there are multiple payment methods for a customer? Chargebee will use the customer's IP address to retrieve the physical address of the customer. It will then attempt to verify the physical address with the customer's billing address. If the country of the physical address (retrieved via the IP addresses) matches the country in billing address that the customer has provided, the customer's location will be marked as VALID. If the IP addresses of the customer cannot be captured, Chargebee will attempt to verify the location of the customer by matching the issuing country (of the payment methods added) with the billing address. If the issuing country of any of the customer's payment methods match the billing address, the customer's location will be marked as VALID. If the above fail, the customer's location will be marked as INVALID. If the customer's billing address is changed, Chargebee will perform its validation checks again. If the recorded IP address information doesn't match the new billing address, the customer's location will be marked INVALID and you will be notified. Chargebee performs its location validation at the time of a charge. A customer's location will not be marked as VALID/INVALID when they signs up for a trial plan or if their payment is not charged on sign-up. Upon charging the card, Chargebee will verify the location of the customer and attempt to collect the payment. The payment will fail if the customer's location validation fails.